Rotator Cuff Exercises are often prescribed to help 'treat' rotator cuff injury and shoulder tendonitis. Sometimes it helps. But mostly 'exercise' entirely misses the mark when trying to target or fix the factors that cause the pain and problem. If you're going to put time and effort (and money) into rehabbing your shoulder, you may want to know what you're doing and why so your can rule out anything that is a waste of that time and effort. 'Stretching and Strengthening' is a common therapy concept at physical therapists' offices. Doctors check out your rotator cuff symptoms, and if surgery isn't the immediate treatment, send you off to Physical Theray. At PT they do stretching and strengthening and ice packs and e-stim, etc. I work with the people it doesn't work for, so I'm rather biased to that its doesn't work. And there's good reason why it doesn't work. In some cases there is 'muscle imbalance' that causes pain and problem. In that scenario, exercises to strengthen certain rotator cuff muscles can balance things out and make pain/problem go away. But if you're in the category where that isn't the case, or isn't the only factor involved, and you spend months doing rotator cuff exercises that are doomed to not being able to help, then what? Then you wasted a lot of time and effort. 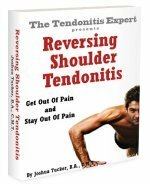 Rotator Cuff Tendonitis is caused by certain factors all working together to cause pain and problem. That's the Pain Causing Dynamic. If you don't reverse all those factors, the problem isn't likely to get better. Do Rotator Cuff Exercises reverse those factors? Which of those do you think stretching and strengthening exercises can help with? At best, the first one. Muscle and connective tissue tightness. Strengthening exercises for the rotator cuff are thought to strengthen weak muscles. Answer: The Rotator Cuff muscle(s) are not weak. If 'weakness' was the issue, then lifting some weights or doing certain strengthening exercises would work. But that rarely makes an actual difference...for very good reason: muscles aren't 'weak'. It's more a dysfunciton where they can't do their job very well and thus can't perform work like they are suposed to. There's a difference between 'weak' and 'doesn't work'. See more about Rotator Cuff Strengthening. Stretching isn't a terrible thing and in the form of something like a daily yoga practice can be a good thing. But when there is Rotator Cuff Tendonitis or Rotator Cuff Injury, stretching doesn' target what you want to target, and can in fact make things worse. Stretching is pulling something apart. The brain does not like that, especially when it thinks there is an injury or danger of injury. Lengthening is creating length in a structure, going from shortened to less shortened (or better yet, appropriate length). When doctors and PT's have you 'stretch', they are trying to make structures that are too tight less tight. That -can- work but usually doesn't for a few reasons including stretching to hard (thus sending a pain signal to the brain), or only stretching a couple times (it takes lots of repetition), or or or. Rotator Cuff muscles/structures are already too tight. If their is pain or injury, there is pain or injury FOR A REASON (more than one reason, really). The pain or injury is a SYMPTOM, it's not the problem itself. See more about Rotator Cuff Stretches. All the same factors apply before/during/after Rotator Cuff Surgery. Meaning, the Pain Causing dynamic was in place before and is still in place afterwards. But surgery can make all the factors of the Pain causing Dynamic worse. If there was a big rip/tear then surgery is likely necessary. But surgery doesn't magically fix anything (though it does obviously reattach torn tissue). But reattaching torn tissue is, again, only one factor of many that must be addressed if you want a full and/or fast recovery. Surgery makes things even tighter. Immobilization after surgery makes muscle and connective tissue even tighter. You have to heal from the surgery and THEN rehabilitate the entire shoulder ecology. Surgeons often prescribe physical therapy and stretching and strengthening after rotator cuff surgery as part of the rehabilitation process. Return to the top of this Rotator Cuff Exercises page.